#Self-Care is becoming the buzz around social media. What is “self-care”, at the root, a form of self-love. “Self-love is the best kind of love!” It could range from dancing your stress away at a workout class, stretching it out during a yoga class, going to brunch with your friends, trying something new (BYOM) – Bring Your Open Mind, or simply “being” in nature or creating something magical at your own home. If you are looking for places to recharge to practice self-care, Nashville has many options! Here are a few places to try. Sip Some Tea and Listen to Live Music – Nashville has many places to relax with a book and sip on some coffee or tea. I love going to The Post East, located in historic East Nashville. The vibe is really laid back and they offer coffee, tea, smoothies and juices. They also have delicious and healthy food options. They specialize in gluten-free, vegan and organic fare that’s “made from the heart.” I have caught them on occasions when they have live music. I saw the very talented Laryse and Saaneah perform there at a Lovenoise pop up events. Brunch with Friends – Connecting with friends is a fun way to re-energize after a busy week. Southside Grill, located in South Nashville, is one of my favorite, family-owned, places for brunch with my girls on the weekend! Their brunch is every Saturday and Sunday from 10am to 2pm. They have a signature “Amaretto Mimosa” that is to die for! Everything on the menu is delicious. My go-to is their three-egg omelette. If I’m craving Chicken and Waffles, I love eating at Shugga Hi Bakery and Cafe! BYOM – Bring your Open Mind – You can find me at True REST(Reduced Environment Stimulus Therapy) in Cool Springs, having a “Float Spa” experience. A “Float Spa” is where you go into your own personal float pod that has 1,000 pounds of Epsom salt, so it makes you feel like floating on air! It helps you to relax, relieves pain, improves sleep…the list goes on. It was so zen! Bethany and Jamie are incredibly nice and welcoming! Bonus Tip – Use the ear plugs and the neck float. It may help you feel more comfortable to relax so you can just float away. Check out an art exhibit – For those who are inspired by the arts, the Frist Art Museum has traveling exhibits from all over the world that come into town. 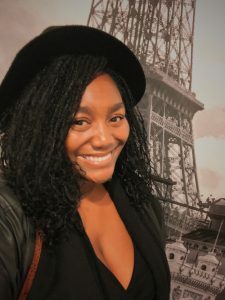 I checked out The Frist Friday: “A Night in Paris – Paris 1900” exhibition and it was “tres magnifique!” People were speaking in French, the artwork was stunning, listened to a retro chic French pop band, and I took pictures in front of the La Tour Eiffel painting! The Frist has lots of exhibits, so I recommend checking their schedule. Connect with Nature– I enjoy feeling “grounded.” Being “grounded” is simply connecting with the earth/nature. Some people like to physically touch the earth by planting things, being a “tree hugger” or just taking their shoes off to feel the grass between their toes. My favorite parks are Edwin and Percy Warner Parks. They have great trails for a walk or run. Move Your Body – Physical exercise is proven to make you feel better. You may catch me sweating it out at a Body Beat by Candice class or dancing at a fitness class led by Jamel at Millennium Dance Complex Nashville. I recently went to a yoga class taught by an amazing friend, health and lifestyle coach, Marsha Eileen, at Kali Yuga Yoga. Marsha finished the class by saying, “The light in me honors the light in you. Namaste.” It was a perfect way to spend my #SelfCareSunday. I may also give myself a soothing facial. I use products from local apothecary, Stomping Ground Herbals. They have a great Symmetry Herbal Facial Care Trial Kit to sample. Tip: I use the trial size for when I travel. I also love Fords Herbal Shop. I love their Hemp Hair Butter for my “edges” and I stock up on their Eucalyptus Vapor Rub. I use it all the time, just to relax. Remember, that self-care comes from within, not from someone or something else. So for me, self-care is a form of self-love. It doesn’t matter what you decide to do, as long as you do something for yourself…unapologetically. Give yourself permission to try new things. That’s the best gift you can ever give yourself. The old saying “when Mama’s happy, everybody’s happy” is still true to this day. Blessings!